Naber doll of Loui (#273), sitting on a chair. Loui is made from natural and cast wood. He is wearing a print shirt, cotton shorts and a black felt hat. His arms and legs are connected to his torso with rope. He has fibrous hair and hand painted eyes and mouth. The Certificate of Authenticity & Warranty states: This is to certify that all Naber Dolls are hand made of natural wood and cast form wood limited to no more than 1001 numbered pieces each. Each doll part is carefully finished, assembled and inspected before leaving our factory. All cast form wood parts have visible seam lines that appear darker than the surrounding area due to higher stain absorption. That is normal and unique to all Naber Dolls. Should any doll part break or suffer damage, we will gladly do out best to restore the doll at our facilities in Homosassa, Florida. 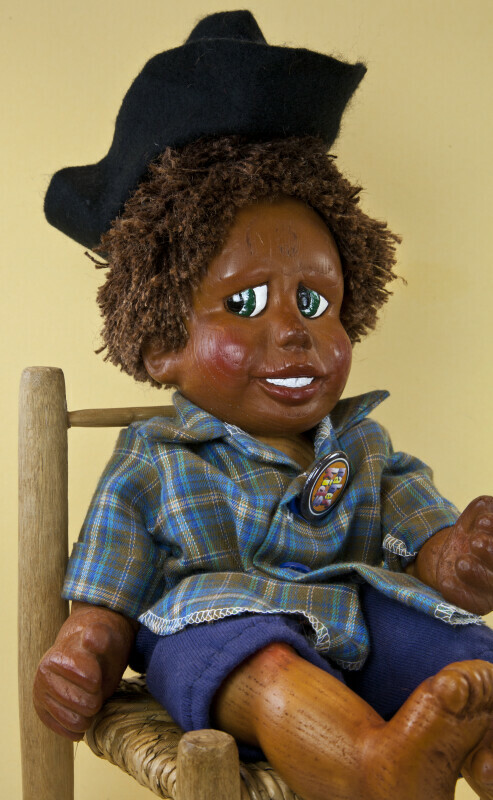 Naber Dolls are quite durable and tough yet they are valuable collectibles (not toys) and should be treated like that. Please keep in mind: the bleaching effect of direct sunlight can be especially devastating to fabrics and painted wood surfaces. The figure stands 20 inches (50 cm) tall.